Martin Burke (left) has had some year. 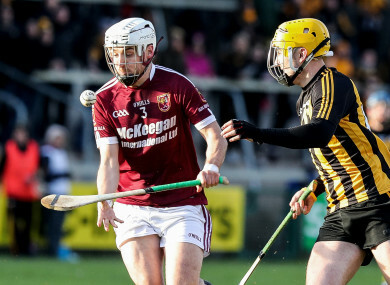 THE STORY OF Ruairi Óg Cushendall winning the 2018 Ulster hurling club championship will in time grow into legend. We’ve all heard those tales of yore as men put their bodies on the line for a common cause, but there is something extraordinary about this group. On Sunday, Arron Graffin is believed to have dislocated his knee, although initial reports are largely positive that he will not require surgery. Earlier this year, Alex Delargy cut the tips of his fingers off in an industrial accident at work. But what tops them all is the story of full-back Martin Burke, who has played this championship series with a broken neck. Burke explained how the unusual injury occurred, saying, “It was the start of the year, the first training session with the county. We were in the gym, I dropped the weight bar down on the back of my neck and broke a vertebrae. While the pain was keen, Burke did not visit a hospital for the first four days. Even now it requires attention and on the way to Sunday’s game, he had team mate Ryan McCambridge massaging the area while travelling in the car from north Antrim. “I was in a collar for four months and the start of August was the first time I was back at hurling,” Burke said. What is most remarkable about his journey has been the lack of any kind of surgery on the broken bone. “No, they said it was stable enough. It hasn’t healed, the Spinal Process is actually just chopped off at the back and it’s non-union, so it hasn’t actually healed,” Burke said. The specialists informed him that his cervical spine is still well covered and protected and there is little pain now, save for a tingling that travels down into his hands that he remains blasé about. “I’ve been told I’m mad,” he says. “You know yourself, I went up to Antrim [Area Hospital] and they tell you, ‘No, no contact sport, give it up.’ It wasn’t until Antrim put me through to see the top specialist that they said ‘this isn’t going to be a problem, you can do your thing’. Email “'We were in the gym, I dropped the weight bar down on the back of my neck and broke a vertebrae'”. Feedback on “'We were in the gym, I dropped the weight bar down on the back of my neck and broke a vertebrae'”.